Some 400,000 civilians stuck in Mosul’s Old City, held by Islamic State militants, are dealing with food and electricity shortages, making the UN High Commissioner for Refugees believe that “the worst is yet to come” in the humanitarian crisis in northern Iraq. “The worst is yet to come, if I can put it this way. 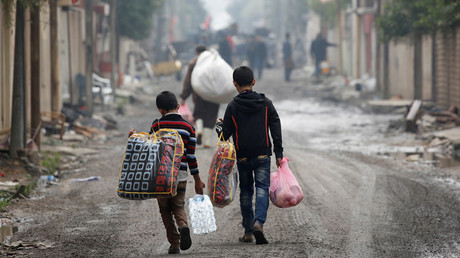 Because 400,000 people trapped in the Old City in that situation of panic and penury may inevitably lead to the cork popping somewhere, sometime, presenting us with a fresh outflow of large-scale proportions,” said Bruno Geddo, representative of the UN High Commissioner for Refugees (UNHCR) in Iraq, according to Reuters. Displacement levels have increased after Iraqi forces began gaining ground in the offensive on the city, with 8,000 to 12,000 people fleeing the area daily, Geddo added, speaking from a reception and transit center at Hammam al-Alil, located 20km (15 miles) south of Mosul. “We also heard stories of people running away under the cover of early morning fog, running away at night, of trying to run away at prayer time when the vigilance at ISIS (Islamic State, or IS) checkpoints is lower,” the UN official said. 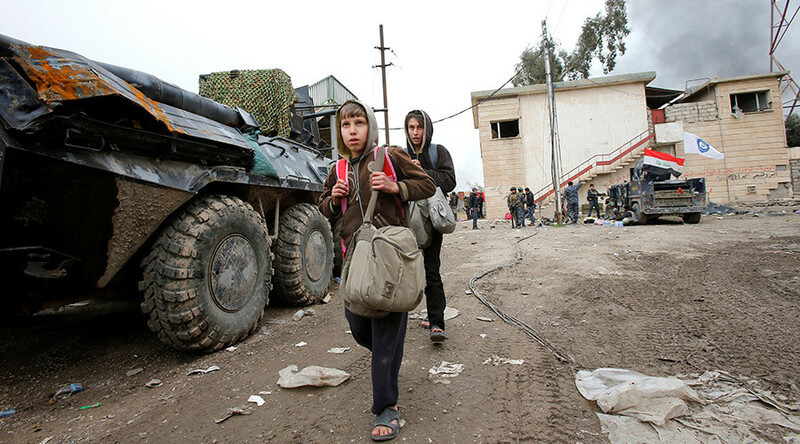 Some 153,000 people have fled western Mosul since February 19, he said. However, not all of those inside the Old City dare to leave the city, as they are afraid of getting caught in the crossfire. Those who stay in Mosul have to burn furniture, clothes and other things to keep warm at nights when temperatures fall significantly and it has been raining heavily recently, Geddo said, as quoted by AFP. “There is a shortage of fuel, of food, of electricity. People have resorted to burning furniture, old clothes, anything they can use to keep warm at night, because it is still raining heavily and the temperatures at night in particular drop significantly,” he said, adding that people are surviving on bread and water and many are reduced to eating once a day. “The more you go without food, the more you become panicked and the more you want to run away. At the same time [the outflow] is increasing, because the security forces are advancing and therefore more people are in a position to run away where the risk is likely more mitigated,” Geddo said. Over 45,000 people have fled the city as fighting between Iraqi government forces and Islamic State militants intensified over the past week, the United Nations Office for the Coordination of Humanitarian Affairs (OCHA) reported on Wednesday. At least 330,000 people have fled Mosul since Iraqi troops backed by US-led coalition launched the military operation in October, with only 72,000 returning home, OCHA reported. Currently, the offensive has been suspended due to bad weather conditions for air support. The government troops are waiting for the weather to improve, Lieutenant Colonel Abdul Ameer said. Fighting in heavily populated west Mosul has turned into quite a challenge for Iraqi forces due to the city’s narrow alleyways and streets that don’t allow armored vehicles and tanks to go through. However, Ameer noted that most of the roads inside the Old City have been sealed off, making fighting militants somewhat easier. Another problem is that the terrorists often use civilians as human shields, which has not stopped the coalition from relying on its bombing campaign. Civilians are afraid of being caught in the crossfire, eyewitnesses told RT, blaming much of devastation inflicted on the city on the airstrikes. The military operation in Mosul has been “unprecedentedly violent” toward the civilian population, Russia’s Foreign Ministry spokeswoman Maria Zakharova said at a press conference in Moscow on Thursday. The plight of civilians caught up in the fighting between Islamic State militants and Iraqi forces backed by the US-led coalition remains widely underreported in much of the mainstream media, unlike the situation in Aleppo in 2016. Speaking to RT on the ground in Iraq, Mosul refugees said they are suffering from US-led coalition airstrikes just as much as they do from the shells and snipers of the jihadists. “Very often the jets would miss. Seven entire families near us were killed this way,” a young female refugee told an RT crew with her account echoing what dozens of other people say. The US says that no more than 200 civilians were killed in coalition airstrikes in Mosul, but a UK-based monitoring group, Airwars, says the number may be more than ten times higher. Just recently, some 80 bodies of civilians were discovered in the rubble of buildings hit in airstrikes in western Mosul, Anadolu news agency reported.